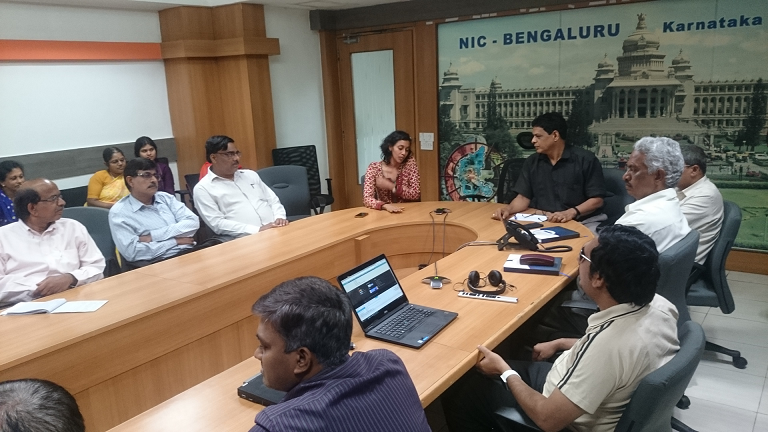 On June 17, 2017, Rakesh Paladugula, a web accessibility trainer and Nirmita Narasimhan made a presentation to scientists of the National Informatics Centre in their office in Bengaluru. The presentation described what is digital accessibility, who it benefits, how to implement it in terms of policy and technology, standards for different domains of accessibility and focused specifically on making web sites accessible as per GIGW. The presentation was attended by around 40 scientists in person and approx. 40 from the districts of Karnataka via video conferencing. The discussion also revolved on key issues with Government web sites, available resources and tools to check for accessibility and tips on how to make them accessible. Some thought was also given to what could be the plan going forward to implement GIGW and any capacity building requirements in this regard.